Drugged, dressed in old-fashioned rags, and fiending for a cigarette, Yolanda wakes up in a barren room. Verla, a young woman who seems vaguely familiar, sits nearby. Down a hallway echoing loudly with the voices of mysterious men, in a stark compound deep in the Australian outback, other captive women are just coming to. Starved, sedated, the girls can't be sure of anything—except the painful episodes in their pasts that link them. Drawing strength from the animal instincts they're forced to rely on, the women go from hunted to hunters, along the way becoming unforgettable and boldly original literary heroines that readers will both relate to and root for. The Natural Way of Things is a lucid and illusory fable and a brilliantly plotted novel of ideas that reminds us of mankind's own vast contradictions—the capacity for savagery, selfishness, resilience, and redemption all contained by a single, vulnerable body. Charlotte Wood is the author of five novels and one book of non-fiction. She has been described as one of Australia's "most original and provocative writers." Her novels have been shortlisted for many prizes, including the Christina Stead Prize for Fiction, the Miles Franklin Literary Award, and the regional Commonwealth Writers' Prize. "Like the surreal prison itself, Ms. Wood's writing is direct and spare, yet capable of bursting with unexpected beauty." "It is, unfortunately, never a bad time to discuss the persistence of violence committed against women, and the perceived ownership of women’s bodies. Wood comes at the issue with a fresh, thrilling perspective: that of a dystopian novelist, one who constructs worlds in dire disrepair, but woefully similar to our own." 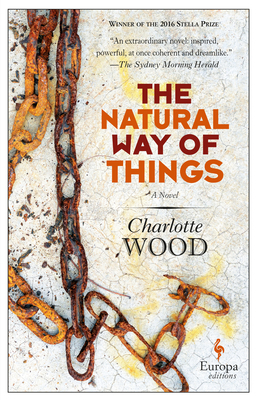 "The Natural Way of Things is a prescient feminist horror novel you need to read." "While there are definite hints of Atwood there, The Natural Way of Things is definitely its own animal." "The Natural Way of Things is an extraordinary novel: inspired, powerful, at once coherent and dreamlike." "It's rare to pick up a novel and from the opening pages be not only gripped by the story on the page but also by the keenness of the intelligence and audacity of the immagination at work." "A modern-day fable of rural gothic dystopia. Think Margaret Atwood, Angela Carter and chuck in a dose of Mad Max's avenging angel Furiosa and you get the idea." "As allegory, as a novel, as vision and as art The Natural Way of Things is stunning." "This is a stunning exploration of ambiguities—of power, of morality, of judgment. With a fearless clarity, Wood's elegantly spare and brutal prose dissects humanity, hatreds, our ambivalent capacities for friendship and betrayal, and the powerful appearance—always—of moments of grace and great beauty...It will not leave you easily; it took my breath away." "A brave, brilliant book. I would defy anyone to read it and not come out a changed person."